This recipe is adapted from one of my favorite cookbooks - Homestyle Cooking from Southern Living. This was so easy to make. I made the meat mixture the night before and assembled the casserole when I got home from work. This was on the table in no time! We both loved this dish, but how could you not with taco meat, cheese and Doritos! You could also use the filling as a quick dip for tailgating - just leave out the crushed Doritos and serve with chips. Preheat oven to 350. Lightly grease a 9x13-inch pan with cooking spray. Brown meat in large skillet. Drain fat. Return meat to skillet. Stir in onions, taco seasoning, chili beans and tomato sauce. 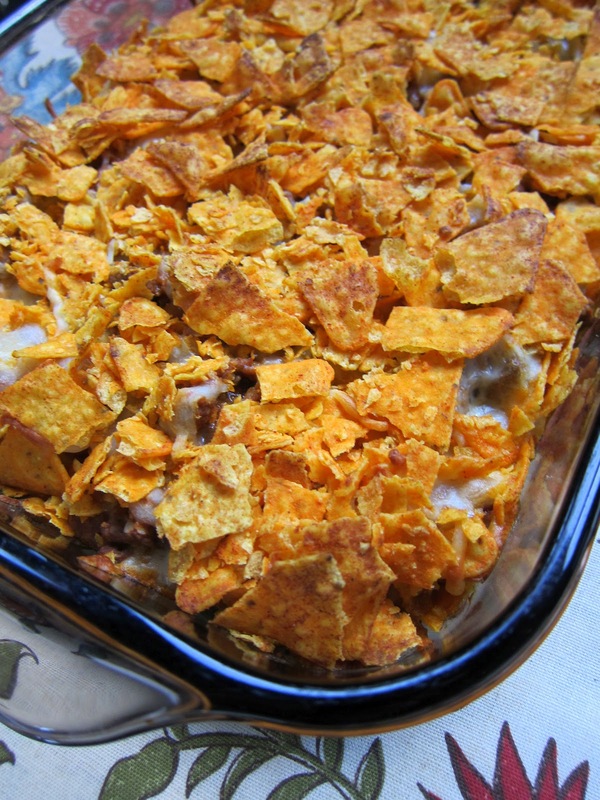 Layer half of meat mixture, cheese and Doritos in pan. Repeat layers. Yummy! I am enjoying SO many of your recipes! Have a blessed day, HUGS! Now that's what I'm talkin' about. I luv luv luv this kind of casserole. this sounds so good!!! can't wait to try it! I have just made it for me, my daughter and two of her friends. They really loved it. We will definetely cook this again. If it's ok I will link your blog to mine and give the german readers a translation. It looks delicious... I am so making this for tonight's dinner. Just got back from grocery store picking up the ingredients. Can't wait to eat it.